Amazon Unleashes Fire Phone To Compete With Apple, Samsung : The Two-Way The new entry into the smartphone arena offers unlimited cloud storage for photos and a 3-D camera with image stabilization. Amazon CEO Jeff Bezos introduces the new Amazon Fire Phone on Wednesday, in Seattle. This post updated at 5:20 p.m. ET. It's called the Fire Phone, and Amazon is hoping that its entry into the mobile arena will prove a hot seller that puts the iconic brand at everyone's fingertips. 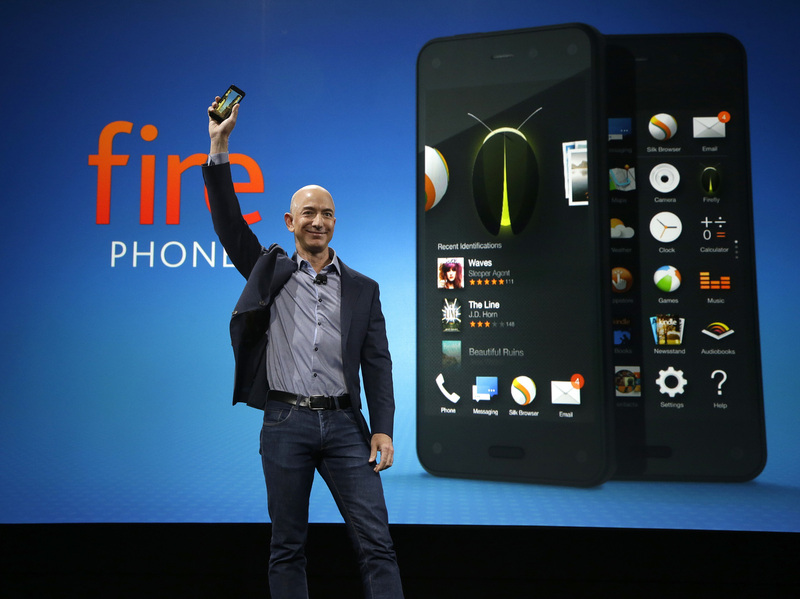 CEO Jeff Bezos introduced the Fire Phone at an event Wednesday in Seattle. In screen size, the Fire Phone's, which measures 4.7 inches diagonally, falls somewhere between the Apple iPhone and its larger competitor, the Samsung Galaxy. The Fire Phone also offers unlimited cloud-based photo storage, "Mayday" live tech support, a camera with image stabilization, and something called 3-D dynamic perspective, which The Verge describes as "multiple front-facing cameras — and software ... [that] update 60 times per second" to produce a 3-D image. "Amazon CEO Jeff Bezos likened it to the move from flat artwork to artwork with geometric perspective which began in the 14th century," The Verge says. And, of course, Amazon Prime members will also be able to access the service's millions of e-book titles. The cost? Customers can place an order Wednesday for the base model with 32 gigs for $200, or $300 for 64 gigabytes (both two-year contracts), but the phones won't be available until July 25. The Associated Press notes: "Competing won't be easy. Amazon is arriving late to a tightly contested marketplace. Samsung and Apple dominate worldwide smartphone sales with a combined 46 percent share, according to IDC. And in the U.S., Apple leads with more than 37 percent, with Samsung at nearly 29 percent." The Wall Street Journal reports that AT&T is set to be the exclusive carrier for the Fire Phone. "I think what Amazon's up to here is beyond devices," NPR's Martin Kaste reports on All Things Considered. "It really is about creating this ecosphere for retail — creating more devices in your life that connect you more tightly with Amazon's products and services."